Yesterday marks the official start of another art week in Shanghai as West Bund Art & Design and Art021 and the 12th Shanghai Biennale make their return to the city, though sculptures and installations have been popping up across the city for several days now. While the first two weeks of the month have repeatedly been making their way into the calendars of industry titans across the globe, the growing importance of the arts in Shanghai is reflective of larger trends across China. In March, Beijing plays host to its own Gallery Weekend and launched the inaugural edition of JINGART in May of this past year. Art Basel in Hong Kong follows just after that, with the newer Art Central running concurrently. As Asia cements its position as a growing hub for visual and performance art, China has made itself a central part of the conversation. Here’s what you can expect from Art 021 and West Bund Art & Design. 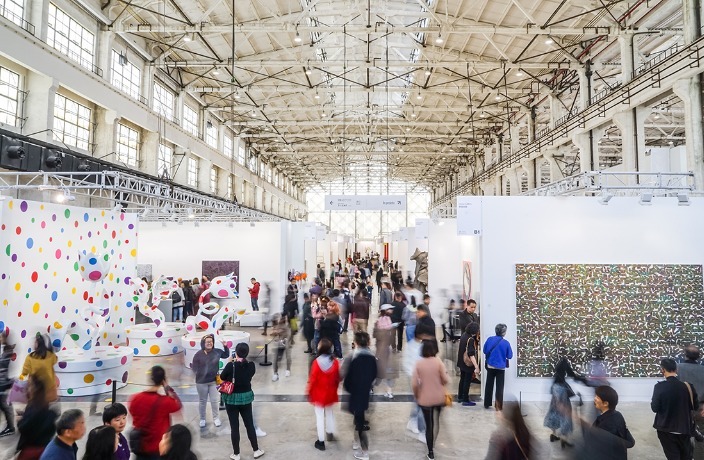 Now in its sixth edition, collectors David Chau, Kelly Ying and Bao Yifeng founded Art021 Shanghai Contemporary Art Fair in 2013. Running from November 8-11 at the Shanghai Exhibition Center, the event brings together top galleries, institutions, collectors and patrons by focusing on local resources while adopting a global perspective. The fair includes five separate sections, housing 103 premier galleries from 30 cities and 18 countries – the broadest geographical range to date. It’s not uncommon for art fairs to showcase works and galleries by named, organized sections. Typically, the individual galleries will a range of their artists and works within the main hall, but the remaining sections revolve around a theme and sometimes extend beyond the physical space. The ‘Approach’ section of Art021 enables galleries to present either a solo or group show that’s organized around a curatorial theme, where ‘Beyond’ exists specifically to cater to installation works, sculptures or large paintings. This year, Whitestone Gallery will stage a live performance painting by Miwa Komatsu, a Japanese originally known for her copperplate practices. ‘ Beyond-Extends’ takes place outside of the exhibition hall, promoting public art and placing installations inside the city center. Finally, ‘Detour: Lived Worlds’ is a curated exhibition that highlights lived experiences, this year engaging with the affected narratives of trade and exchange in the Pacific Rim. Photo courtesy of West Bund Art & Design. The fair will also be launching a new section named Dream Video 100, where they will feature more than100 film and videos on an outdoor LED projection wall at the Dream Center on the West Bund Plaza. With a growing attention toward and influx of new media works, the fair aims to provide a glimpse into the diverse development of Chinese and international video art. The 12th Shanghai Biennale will open at Power Station of Art on November 10 under the theme ‘Proregress – Art in an Age of Historical Ambivalence.’ It will run during regular hours all the way through to March – so you can skip the art week crowds and see it anytime in the next few months. Photos courtesy of West Bund Art & Design. Art021: Until 11, check the event schedule for individual times, RMB100 early bird, RMB150 regular. Shanghai Exhibition Center, see event listing. West Bund Art & Design: Until Nov 11, check the event schedule for individual times, RMB130-150. West Bund Art & Design Center, see event listing. 12th Shanghai Biennale: Until Mar 10, Tuesday-Sunday 11am-8pm, ticket prices vary. Power Station of Art, see event listing.